A majestic Bald Eagle is perched in a tree at the Lower Klamath Lake National Wildlife Refuge scoping out a meal. Image by Jason McMurry. Home to Over 350 Bird Species, the Klamath Basin is unmistakably bird country. It is one of the top birding locations in the nation, and is one of the largest migratory stopovers for birds in the western United States. Basin Adventures is brought to you by the Klamath Falls KOA, your adventure hub of the Klamath Basin. Birding in Klamath is a year-round activity with natural high-elevation valleys surrounded by mountains. The region contains diverse habitats from desert lakes, wetlands and rivers to rain forests along the edges of the Cascade Mountain range making this area a birder’s paradise. As a major waterfowl and wetland species nesting site, and stopover and wintering areas for various species, the Klamath Basin is located along the Pacific Flyway, the largest flyway in North America. 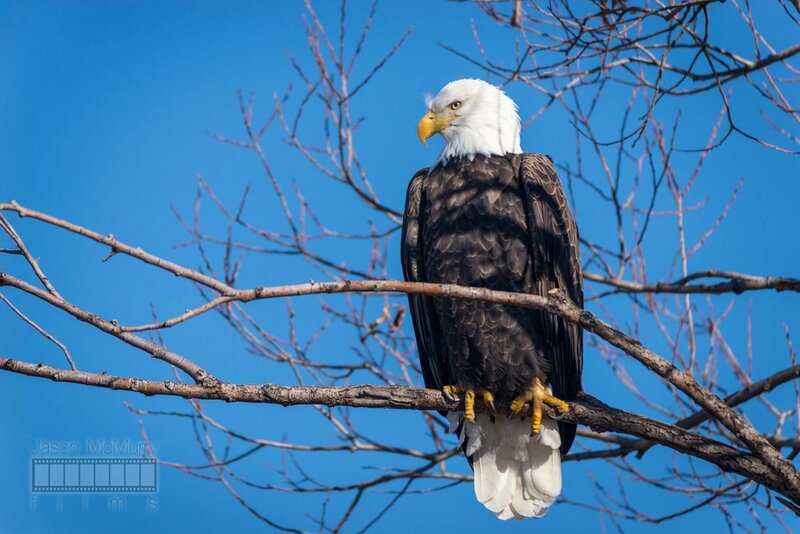 In winter, you are likely to view the largest concentration of Bald Eagles in the lower 48 states. Predictably you can see Tundra Swans, Snow Geese, Canada Geese, egrets, herons, hawks, owls, grebes, and many more at one or more of the six National Wildlife Refuges in our area. Be sure to bring your camera and binoculars to catch all the action. Some of the best bird watching comes from the areas National Wildlife Refuges – collectively managed as the Klamath Basin National Wildlife Refuge Complex. Each NWR has its own unique and diverse biodiversity. 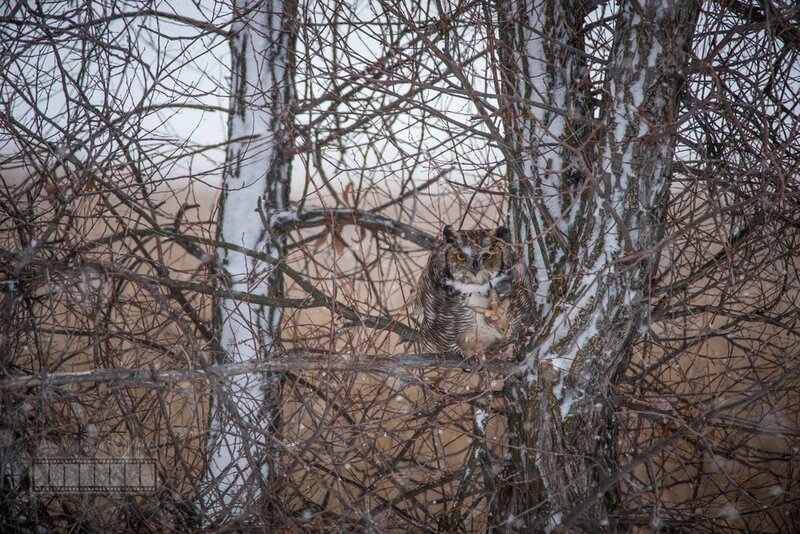 A Great Horned Owl sits calmly camoflauged in a tree. Image by Jason McMurry. Located 2 miles north of Rocky Point, Oregon the Upper Klamath NWR comprises of 23,098 acres, mostly freshwater hardstem-cattail marsh and open water, along with approximately 30 acres of forested uplands. These habitats serve as excellent nesting and brood rearing areas for waterfowl and colonial nesting birds, including American white pelican and several heron species. Bald eagle and osprey nest nearby and can sometimes be seen fishing in refuge waters. This refuge consists of a naturally occurring cattail-bulrush marsh at the edge of Upper Klamath Lake. Currently a fire management plan is being developed so that marsh management and vegetation can be manipulated by using prescribed burning. Waterfowl densities are monitored during the fall, winter and spring via aerial census. Ongoing research projects include yellow rail and neotropical migrants by refuge cooperators who operate out of the Rocky Point cabin area. Tule Lake Refuge is located in the fertile and intensely farmed Tule Lake Basin of northeastern California. It was established in 1928 by President Calvin Coolidge as a, “preserve and breeding ground for wild birds and animals.” This 39,116-acre refuge is mostly open water and crop land. Approximately 17,000 acres are leased by potato, onion, horse radish, alfalfa, and cereal grains within the Public Lease Lands program administered by the U.S Bureau of Reclamation. Permit holders farm an additional 1,900 acres in cooperation with the U.S. Fish and Wildlife Service (FWS). The endangered Lost River and short nose suckers live in or use this refuge. The refuge is a significant staging area for migrating waterfowl during spring and fall migrations. It is used primarily by white fronted, snow, Ross, and cackling Canada geese, all of which nest in the Arctic tundra. Tule Lake hunting opportunities consist of two large marsh units accessible by boats, a spaced-blind hunt in dry fields, and open free-roam areas offering field hunts over harvested grain and smaller marsh units. A 10-mile auto tour route allows for wildlife observation throughout the year. Wetlands are abundant throughout the Klamath Basin NWR Complex. This image shows, Stukel Mountain and wetlands of the Lower Klamath NWR.Image by Joe Spendolini. The Lower Klamath National Wildlife Refuge located in rural northeastern California and Southern Oregon, was established by President Theodore Roosevelt in 1908 as the Nation's first waterfowl refuge. The Lower Klamath Refuge is managed out of Tule Lake National Wildlife Refuge's visitor center as a part of Klamath Basin National Wildlife Refuge Complex which is comprised of 6 different refuges located in Southern Oregon and Northern California. The refuge, with a backdrop of 14,000-foot Mount Shasta to the southwest, is listed in the National Register of Historic Places as a National Historic Landmark. The 50,092-acre refuge is a varied mix of intensively managed shallow marshes, open water, grassy uplands, and croplands that provide feeding, resting, nesting, and brood-rearing habitat for waterfowl and other water birds. This refuge is one of the most biologically productive refuges within the Pacific Flyway. Approximately 80 percent of the flyway's migrating waterfowl pass through the Klamath Basin on both spring and fall migrations, with 50 percent using the refuge. Peak waterfowl populations can reach 1.8 million birds, which represent 15 to 45 percent of the total birds wintering in California. The refuge produces between 30,000 and 60,000 waterfowl annually. The refuge is also a fall staging area for 20 to 30 percent of the central valley population of sandhill crane. From 20,000 to 100,000 shorebirds use refuge wetlands during the spring migration. Wintering wildlife populations include 500 bald eagle and 30,000 tundra swan. Spring and summer nesting wildlife include many colonial water birds, such as white-faced ibis, heron, egret, cormorant, grebe, white pelican, and gulls. A Great White Egret. Image by Joe Spendolini. Established in 1911, this 46,460 acre the Clear Lake NWR consists of approximately 20,000 acres of open water surrounded by upland habitat of bunchgrass, low sagebrush, and juniper. Small, rocky islands in the lake provide nesting sites for the American white pelican, double crested cormorant, and other colonial nesting birds. The upland areas serve as habitat for pronghorn antelope, mule deer, and sage grouse. Except for limited waterfowl and pronghorn antelope hunting during the regular California State seasons, the refuge is closed to public access to protect fragile habitats and to reduce disturbance to wildlife. The Clear Lake Reservoir is the primary source of water for the agricultural program of the eastern half of the Klamath Basin with water levels regulated by the U.S. Bureau of Reclamation. 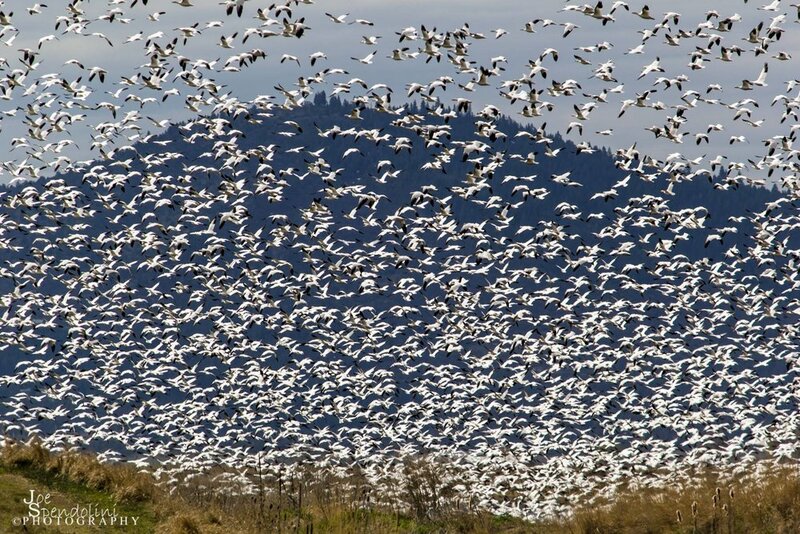 A flock of Snow Geese prepare to land at the Miller Island NWR, a section of the Lower Klamath NWR. Image by Joe Spendolini. The Klamath Marsh National Wildlife Refuge was established in 1958 "... as an inviolate sanctuary, or for any other management purpose, for migratory birds." The refuge primarily consists of 40,000 acres of wet meadows and open water wetlands. This large natural marsh, with a backdrop of the Cascade Mountain Range in central Oregon, encompasses the upper reaches of the Williamson River and provides important nesting, feeding, and staging habitat for waterfowl and sandhill crane. The refuge also appears to be one of the last remaining strongholds of the spotted frog, a candidate for the endangered species list. This refuge along with the 15,000 acres of wetlands on the nearby Upper Klamath Refuge has a rich cultural heritage. It includes part of the historic lands and former reservation used by the Klamath tribes. The Bear Valley NWR is full of mature stands of trees that have open branching patterns of large limbs which allow easy eagle access and can support many birds. Located on a northeast slope, the roost also shelters these raptors from the harsh and prevailing winter winds. In recent years, as many as 300 bald eagles have used the roost in a single night. 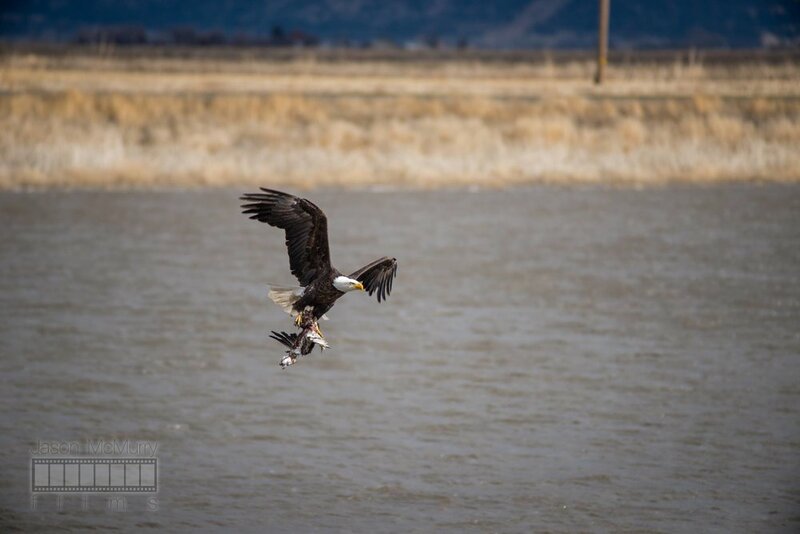 Bear Valley National Wildlife Refuge also serves as a nesting habitat for several bald eagle pairs. Please note, to reduce disturbance to the birds, Bear Valley Refuge is closed to all public entry except for walk-in deer hunting before November 1. Eagles can be observed safely in the area during the pre-dawn "fly-out" on Bear Valley Road, near Worden. Data for this story correlated from: Meet Me in Klamath & US Fish and Wildlife. Basin Adventures is brought to you by the Klamath Falls KOA. 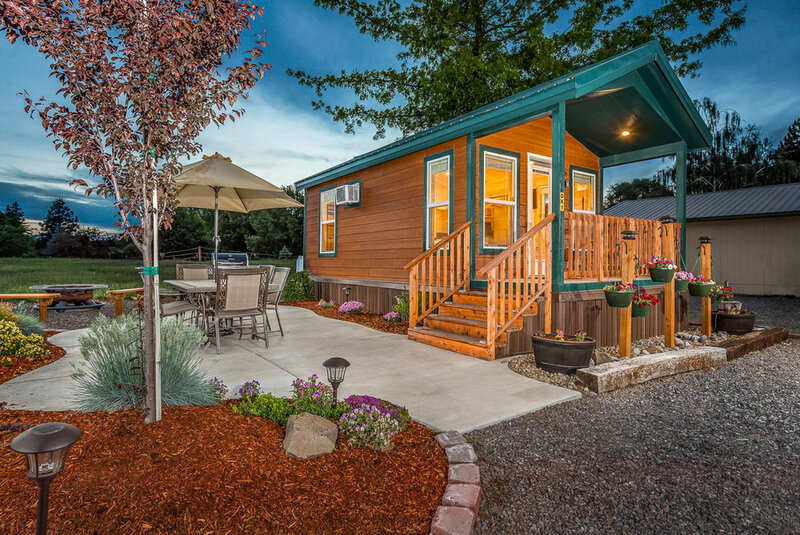 Centrally located in Klamath Falls, the Klamath Falls KOA is the perfect jump-off point to visit all the spectacular recreation sites of the Klamath Basin – Crater Lake National Park, Lava Beds National Monument, wildlife refuges, hiking, biking, fishing and so much more. Visit http://koa.com/campgrounds/klamath/ for more details and to book your next adventure base camp.